Prepare a hot grill fire or heat gas grill to 400℉. In a medium saucepan combine quinoa, 1¾ cups water, and ½ teaspoon salt. Bring to a boil, cover, reduce heat to medium-low, and simmer until tender, 12 minutes. Transfer to a plate to cool. Brush romaine, avocado, and corn with oil. Grill romaine and avocado just long enough to achieve grill marks, and set aside. Grill corn until charred and cooked, about 5 minutes. Roughly chop romaine, cut corn kernels from cobs, and dice avocado. In a blender combine cilantro, lime juice, oil, garlic, cumin, and ½ teaspoon salt and blend until smooth. 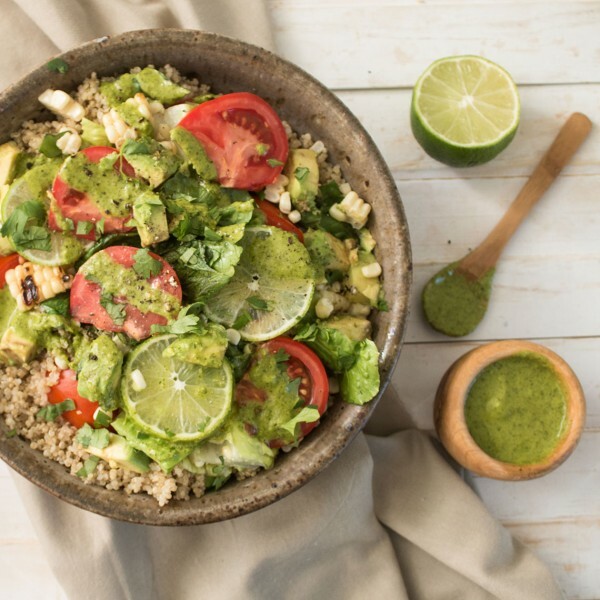 In a serving bowl, toss quinoa with romaine, corn, avocado, tomatoes, and dressing and garnish with cilantro.